Our company is the major company known for providing Floor Decking Sheet to the clients. Offered range is designed and developed with high-grade basic material and state of the art technology. This product made in adherence to the established quality guidelines of the industry. 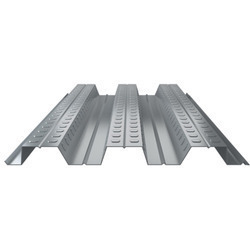 Floor Decking Sheet is used as the floor of many high buildings. Please note prices are depend on buyers requirement. Thirumala Roofings and Structurals has conceived its business operations as a Partnership based firm with our operational headquarters located at Chennai, Tamil Nadu (India). We conceived our business operation in the year 2013. We are engaged in manufacturing, trading and supplying of Roofing Sheet, Polycarbonate Sheet, Galvanized Purlin, PUF Panel and many more. We also provide services like Roof Designing Service, Fabrication Service, Roofing Contractor Service and many more. Our offered range of products is highly qualitative and easy to clean. They are finely processed at our well equipped manufacturing and other processing units. Our entire products have the high quality and customers can avail them at most reasonable prices. With our qualitative goods and services, we are serving several industrial sectors. We have created a long list of satisfied clients and regularly we received orders from them. Prompt delivery, fair trade practices and cost effective price structure further solidifies our position in the industry.